Mamukas life revolves around his horses and hunting in Nikortsminda where he lives..
Mamuka has bad memories from the wars. MAMUKA HAS FOUGHT for the Russians during the communist era in Ngorno Karabach and Dagestan. And against Basajevs separatists and Russian SPETZNAS in break-out republic Abkhazia for Georgia in the early nineties. 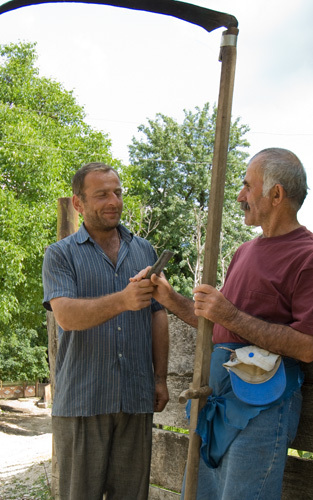 Mamuka is an engineer, but now he spends his life in Nikortsminda taking care of his horses and his small farm. He is a sincere and much respected man. One you instantly know you can trust. One horse stolen, another one shot. The day we arrived Nikortsminda, Mamuka came to our dacha very upset. Someone had stolen his little horse and shot the big one. It had happened just that moment, half an hour ago. The little horse was gone, and he reckoned that the big one was shot because it tried to protect the little one.It survived, but the bullet was still in the leg. That’s a big problem because there is no professional veterinaries around Nikortsminda that could do a job like this. Mamuka couldn't afford one anyway, so he was very much afraid of what's going to happen with the injured horse. Horses are his life, and to lose one is as bad as losing ten for him. When I visited him later, I saw the horse, and noticed no exit wound in the leg. That means a slow death, or that he just has to put it down. He has no enemies as he know of. The last ones are dead. They robbed him and his friends one night in his home at point blank; masked. They even stole his kalashnikov. He know who did it, but never managed to get his revenge. They all got killed in different episodes before he reached them. The little horse was going to be a gift to a friend who had helped Mamuka a lot. So maybe the thieves wanted to hurt his friend, he wonders. Everyone in the district knew that the horse was for his friend. He would fight the Russians any time. Mamuka was really glad to hear that Basajev had been killed this summer. 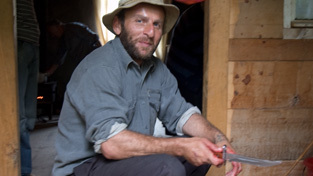 His eyes are angry: "Basajev was nothing but a simple murderer. But opposed to what people has been lead to believe, Basajev and the rebellions was supported by the Russians. At the same time the Russians had a peace keeping mission in the rebel republic with mandate from the UN. But I know who we fought against. I saw the uniforms and ID-cards on the dead soldiers: It was Russian SPETZNAS-forces". Mamuka has been angry for many years after Abkhazia. During communism he was enrolled in the Russian army and had to fight in Dagestan and Ngorno Karabach. This has marked him. 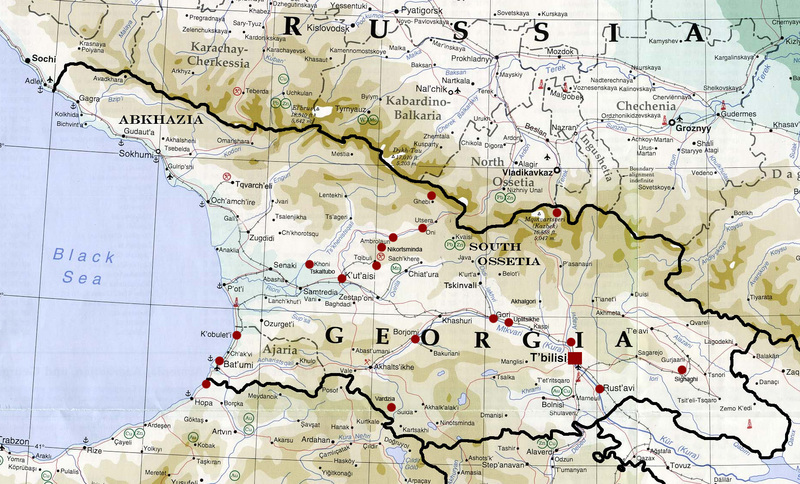 "Now we have South Ossetia and the separatist problems there where Russians supply them with weapons. I would gladly fight the Russians again, make no mistake about that!" Last time we spoke, Mamuka promised me to take me hunting. That's one of his passions. Hunting wild hogs is maybe what he likes the most. It is demanding and very exiting. But also hunting rabbits can be fun. 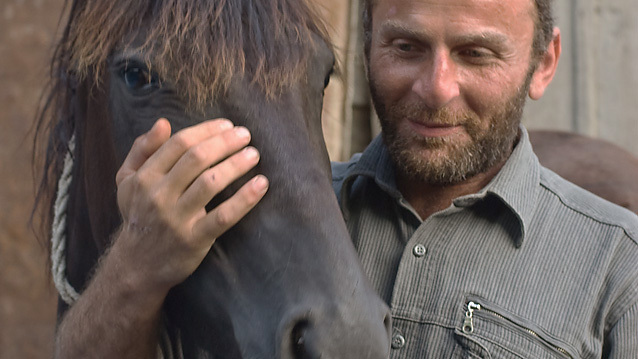 When I left Nikortsminda some days after it was not clear what was going to happen, but the horse survived, and Mamuka, somewhat unexpected married a woman and moved to Rustavi in early 2008. I didn’t meet him this summer in Nikortsminda. On the way to cut grass for the cows and horses. One day he helped us butcher a calf.